George Papaconstantinou, a former finance minister of Greece who negotiated the country’s first bailout, is the author of Game Over – The Inside Story of the Greek Crisis. Unlike the United Kingdom, Greece is one of the European Union’s smaller economies, notorious for its weak institutions and economy, and a net recipient of EU funds. And yet the Grexit near-exit from the EU in 2015 offers important lessons for the final stage of Brexit negotiations. The below statistics (source: Bank of Greece) show the development of the aggregate balance sheet figures of the Greek banking sector (all banks except the Bank of Greece) since the beginning of the financial crisis. Aggregate means that the figures are simply added up and not consolidated, i. e. there may be overstatements in some categories. For the years 2010 and 2015, the figures are as of June. For 2018, the figures are as of September (in BEUR). There can be little doubt that the last few decades have brought more frustration than progress to the Balkans. It would be ironic and deeply gratifying to see a region wracked by ethnic nationalism build bridges when so many others are building walls. ROME—The end of Greece’s marathon bailout on Monday would mark the closure of the eurozone crisis—if only it weren’t for Italy, and nagging fears that the euro isn’t fixed after all. European Union authorities will hail as a victory the completion of Greece’s financial-rescue program, an eight-year drama that triggered a wider European sovereign-debt panic. Greece’s economy has begun to grow again, although recovery has far to go. Defying many predictions, Greece has stayed in the euro, thanks to the strength of public support for keeping the currency, even amid one of the deepest economic depressions of modern times. Meanwhile French President Emmanuel Macron, German Chancellor Angela Merkel and other EU leaders are discussing the next moves to bolster the currency union, building on various overhauls since the crisis. Last month, the IMF pubslished its 2018 Article IV Report on Greece and it was widely commented in the media. I have now read the full 80+ pages and can only recommend others to read the full report. It can be found under this link (under the caption Electronic Access, click on Free Full Text). Below is the Annex VI about Greece’s Long-Term Growth Potential. 1. Greece is set to experience dramatic population aging over the next several decades. In its 2018 Aging Report, the EC projects Greece’s working age population to fall by about 35 percent between 2020 and 2060 due to a shrinking and rapidly aging population. This is among the largest such declines in the Euro Area, and three times the average fall for the Euro Area. Ceteris paribus, aging would imply an average yearly decline of 1.1 percentage points in Greece’s labor force during the next four decades. Andreas Georgiou korrigierte das griechische Staatsdefizit für 2009 auf 15,4 Prozent – nachdem Athen 3,9 Prozent gemeldet hatte. Der Grieche Andreas Georgiou hatte als Chef der nationalen Statistikbehörde das Staatsdefizit seines Landes korrigiert und an Brüssel gemeldet. Nun wurde er verurteilt, weil er die Berechnung nicht politisch abstimmen ließ – das aber ist in keinem Gesetz auch nur vorgesehen. Seine vermeintliche „Pflichtverletzung“ bringt ihm nun zwei Jahre Haft auf Bewährung ein. Für die Kunst, Staatsdefizite klein zu rechnen, gab es einst den Begriff „Greek Statistics“, bis ein Statistiker kam, der in Athen mit den geschönten Haushaltszahlen aufräumte. Damit erwarb sich der Grieche Andreas Georgiou höchstes Lob der EU. In seiner Heimat aber soll Georgiou dafür büßen. Der oberste griechische Gerichtshof verurteilte den einstigen Chef der nationalen Statistikbehörde Elstat jetzt zu zwei Jahren Haft auf Bewährung, wegen „Pflichtverletzung“. Nach seinem Amtsantritt im August 2010 hatte Georgiou das Etatdefizit für 2009 auf 15,4 Prozent korrigiert, Athen hatte zuvor nur 3,9 Prozent nach Brüssel gemeldet. Das Gericht verurteilte Georgiou, weil er die von ihm ermittelte Defizithöhe nicht in dem damals existierenden politisch besetzten Aufsichtsgremium von Elstat abstimmen ließ, bevor er Eurostat informierte. Eine solche politische Abstimmung ist aber weder im griechischen Statistikgesetz noch nach EU-Regeln vorgesehen, sie betonen die Unabhängigkeit des Statistikamtes und seines Chefs. ROME—This week’s high-profile political crises in Spain and Italy are making plain the social and economic scars Southern Europe bears almost a decade after the eurozone crisis, destabilizing traditional alliances and feeding political discontent. In Italy—now home to Western Europe’s largest antiestablishment movement—two large outsider parties are coming to power, bolstered by the votes of millions of Italians stuck in a cycle of stubbornly high unemployment and poverty. Severe political uncertainty, chronic slow growth, and a sovereign-debt level currently hovering around 160% of GDP already is enough for Italy to trigger a debt crisis. And there is no plausible resolution that would not generate additional risks and complications. STOCKHOLM – The political upheaval and social unrest fueling the current crisis in Italy should surprise no one. On the contrary, the only uncertainty was when exactly matters would come to a head. Now they have. Italy’s per capita GDP in 2018 is about 8% below its level in 2007, the year before the global financial crisis triggered the Great Recession. And the International Monetary Fund’s projections for 2023 suggest that Italy will still not have fully recovered from the cumulative output losses of the past decade. Among the 11 advanced economies that were hit by severe financial crises in 2007-2009, only Greece has suffered a deeper and more protracted economic depression. Greece and Italy were the two economies carrying the highest debt burdens at the outset of the crisis (109% and 102% of GDP, respectively), leaving them poorly positioned to cope with major adverse shocks. Since the crisis erupted a decade ago, economic stagnation and costly banking weaknesses have propelled debt burdens higher still, despite a decade of exceptionally low interest rates. Greece has already faced more than one “credit event” and, while Italy has also had a couple of close calls, the spring of 2018 is turning out to be its most tumultuous episode yet. The summer will probably be worse, bringing Italy closer to a sovereign debt crisis. On the surface, general government debt appears to have stabilized since 2013, at around 130% of GDP. However, as I have stressed here and elsewhere, this “stability” is misleading. General government debt is not the whole story for Italy, even setting aside the private debt loads and the recent renewed upturn in nonperforming bank loans (a daunting legacy of the financial crisis). When evaluating Italy’s sovereign risk, the central bank’s debts (Target2 balances) must be added to those of the general government. As the most recent available data (through March) show, these balances increase the ratio of public-sector debt to GDP by 26%. With many investors pulling out of Italian assets, capital flight in the more recent data is bound to show up as an even bigger Target2 hole. This debt, unlike pre-1999, pre-euro Italian debt, cannot be inflated away. In this regard, it is much like emerging markets’ dollar-denominated debts: it is either repaid or restructured. Severe political uncertainty against a backdrop of chronic slow growth and a sovereign-debt level currently hovering around 160% of GDP already is enough to trigger a debt crisis. 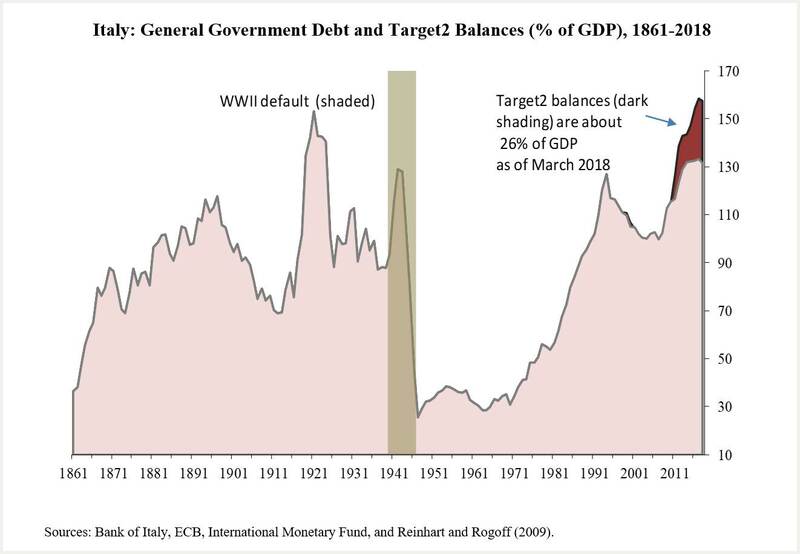 Adding to these fundamentals, populist rhetoric about introducing a quasi-currency or small-denomination IOUs (presumably to finance ambitious spending plans and larger budget deficits), and about not honoring the Bank of Italy’s debt, adds fuel to the financial fire. Italy’s instability is already having international repercussions, and the current bout of global uncertainty is far from over. Close to home, as Italian bond yields climb and oscillate with the rumor mill, yields for Spanish, Portuguese, and Greek bonds have been driven higher. Moreover, the Italian story is unfolding as Greece closes in on an agreement in June about its exit late this summer from dependence on Europe’s bailout framework. One can only hope that political contagion from Italy does not further complicate these negotiations. Farther afield, the weakness in the euro has translated into dollar strength, which means a sustained beating for emerging markets, particularly those with US dollar debt. The flight to quality that accompanies outbreaks of financial turbulence is reinforcing a shift away from some of the riskier asset classes of which emerging markets are a part. International equity markets have not been exempt from contagion. How do such episodes typically end? The most desirable outcome – rapid resolution that places the source of contagion on a sustainable growth path – appears improbable in Italy’s case. Meaningful debt renegotiations are seldom swift: creditors want repayment, and debtors want a write-down. As Christoph Trebesch and I have documented, negotiations seldom get it right on the first – or even the third – try. Initial restructuring agreements tend to fall short of the magnitude needed to achieve debt sustainability. Still, it is difficult to see how restructuring of Italy’s debt can be avoided altogether. The alternative – exclusive reliance on a bailout – is tempting, as it may temporarily calm markets. But a bailout would only kick the can down the road. The fact that Greece’s debt problems still have not been resolved should serve as a warning. In the mildest of scenarios, only Italy’s official debt – held by other governments or international organizations – would be restructured, somewhat limiting the disruptions to financial markets. Yet restructuring official debt may not prove sufficient. Unlike Greece (post-2010), where official creditors held the lion’s share of the debt stock, domestic residents hold most of Italy’s public debt. This places a premium on a strategy that minimizes capital flight (which probably cannot be avoided altogether). At this stage, policymakers should aim for a resolution of Italy’s woes that does not generate additional risks and complications. But there is little reason to expect them to hit the target. OF THE €57.7bn ($68.2bn) of loans that Piraeus Bank, one of Greece’s four dominant lenders, had on its books at the end of March, €20.5bn were more than 90 days overdue. A further €11.7bn were also deemed unlikely to be repaid. In all, at the end of 2017 Greek banks carried €95.7bn of such non-performing exposures (NPEs)—at 43.1% of loans, the heaviest burden in Europe. Still, the pile was €13bn smaller than at its peak in March 2016. The banks plan to reduce it by €30bn this year and next.